Hartford and New Haven (twin capitals), 1701-1875. Hartford, since 1875. January 9, 1788, 5th State. Connecticut is bordered on the south by Long Island Sound of the Atlantic Ocean. Economy: Service industries make up the bulk of Connecticut's economy. Manufacturing is also important. Manufacturing: Production of transportation equipment, most of it for military use (aircraft parts, helicopters, submarines), is Connecticut's most important manufacturing activity. Ranking second is the manufacture of machinery (bearings, computers, machine tools, printing machinery) followed by fabricated metal products (cutlery, hardware, nuts, bolts, rivets, washers, etc). 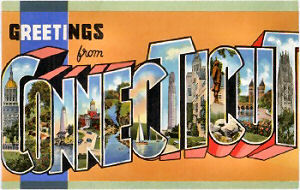 Services: Finance, insurance and real estate are the largest industries in Connecticut. Hartford is an insurance center. Second are the community, business and personal service industries (as private health care, engineering and law firms, and computer and data processing services, tourism). Wholesale sale of fuels, lumber and farm products and retail (automobile dealerships, department stores, food stores, and restaurants) rank third. Mining: Crushed stone is Connecticut's leading mined product followed by sand and gravel. Highest Point: Mount Frissell, 2,380 feet above sea level. Natural Resources: Connecticut does not have large natural resource reserves like many other states. There are many forests, but they are not commercially viable. Connecticut has no large mineral deposits. Much of the soil is unsuitable for farming.